China is one of the few countries increasing its presence on the medium wave (AM) radio dial, as DXers have been able to observe. Identifying Chinese stations can however be tricky if you don't understand the language. With this guide you will learn how to identify Chinese stations based on just a few keywords and phrases. Don't let the language barrier intimidate you, because DXing Chinese stations can be extremely exciting and rewarding. Standard Chinese (Putonghua) is the official language both in the People's Republic of China and the Republic of China (Taiwan). It is a spoken form of Chinese based on the Beijing dialect of Mandarin Chinese. In this article we won't delve into written Chinese and its thousands of characters, nor the four tones of the language, but will instead use a phonetic transcription known as pinyin, which will help you to recognize Chinese words as you hear them. Not all Chinese-language radio stations originate from China, and on the other hand, not all broadcasts from China are in the Chinese language. First we'll learn how to tell the difference between Chinese-language stations in mainland China and the rest of East Asia. In the very end of the article we will also briefly discuss some of the many minority languages that can be heard on stations in mainland China. This article is a practical guide to understanding Chinese station identifications. Therefore, let's assume that you've heard an AM station, which you think could be Chinese, and you even have a recording of what might be the ID. Listings of Chinese stations are of course an essential reference guide, but with these instructions you can probably figure out your ID and also learn a lot along the way. When you're hearing Chinese language on the AM or shortwave dial, the first question is whether the broadcast is from the People's Republic of China or elsewhere. There are two main clues that can point to mainland China: a time announcement where Beijing is mentioned, and the use of the word "people" (renmin) in the station identification. At the top of the hour most mainland Chinese stations air a time signal, followed by a time announcement indicating the time in Beijing time. The entire vast country observes only this one time zone, which is eight hours ahead of Universal time (UTC/GMT), year around. - 1600 UTC (24.00 Beijing time): "Beijing shijian ling dian zheng"
The time announcement usually follows a familiar pattern "Beijing shijian (Beijing time) ... dian (o'clock) zheng (exactly)". If you hear this, you can be sure that you're listening to a mainland Chinese station. However, the opposite is not true. Even if you don't hear Beijing time mentioned, the station can still be from mainland China, where many stations nowadays prefer a less formal image, ditching official time announcements altogether. In any case, listening carefully around the top of the hour is your best opportunity to catch a station ID from a Chinese station. Also the end of any top-of-the hour newscast and 30 minutes past the hour are slots worth checking out. Especially during overnight hours some stations may not react to the top of the hour at all. People or no people in the station ID? The station identification has traditionally been aired immediately after the time announcement. Increasingly often there is a commercial spot or two in between, but the station ID might also be heard before the top of the hour. Sometimes the ID is announced twice, both by a male and a female voice, making the DXer's challenge easier. The most common station ID goes like this: "Zhongyang renmin guangbo diantai" (literally "Central People's Broadcasting Station"). This is China National Radio (CNR). It can be argued that tientai would be a better transliteration than diantai, but for the sake of simplicity we'll stick to pinyin spelling. Here is an example of what you can hear on CNR at the top of the hour. First there is a time announcement by a female voice at 8 seconds into the recording. Based on the previous sound bites, you now know that the time in Beijing is 22 hours ("Beijing shijian er shi er dian zheng"). What follows at 11 seconds is a very fast station ID "... Zhongguo zhi sheng", then there is a pre-recorded promotional announcement. After the CNR interval melody there is a more thorough station ID at 50 seconds into the clip: "Zhongyang renmin guangbo diantai, Zhongguo zhi sheng", then at 66 seconds the beginning of the news: "Zhongguo zhi sheng, yang guang ye xinwen" (Voice of China CNR Night News). 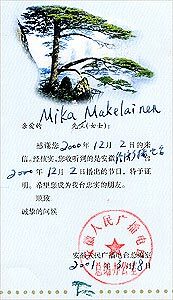 The keyword here is renmin (people), which is unique to China and other communist countries. If you hear renmin in the station ID, you've heard a station from mainland China. However, an increasing number of Chinese stations prefer to skip the renmin in their ID. As an example, you can compare how Hubei People's Broadcasting Station identified in 2007 ("Hubei renmin guangbo diantai" twice, thankfully pronounced very slowly) and in 2012 ("Hubei zhi sheng" meaning the Voice of Hubei, at 16 seconds). Both identifications were heard on the same channel, News General Service. As the Hubei clips show, the pattern of the station identification is usually identical on the national and provincial (or local) level. Just replace "Zhongyang/Zhongguo" (Central/China) with the name of the province or city and you know what words to look for when trying to locate a station ID. With some practise you will learn to recognize the crucial keywords even if you don't understand anything else of the program content. If you don't hear renmin mentioned, let's consider for a moment the possibility that your Chinese-language catch is not from mainland China. The Taiwanese national broadcaster is known as Broadcasting Corporation of China (BCC). There are several BCC networks and loads of other public and private stations, none of which include renmin in their name. As an example, here is a station ID of the BCC News Network: "Zhong guang xinwen wang, News radio" ("BCC News, Newsradio"), followed by the time announcement: "Xianzai shijian, liang(2) dian zheng" ("Now the time [is], 2 o'clock exactly"). After the distinctive melody you can hear a station ID "Zhongguo guangbo gongsi" at 20 seconds into the clip, then "Gewei hao, huanying shouting zhong guang xinwen, wo shi Wang..." ("Hello everybody, welcome to listen to Zhong guang news, I am Wang...") from 29 seconds. Romanization of the Chinese language in Taiwan is more complicated than in mainland China, because different spellings are used. For example, "China broadcasting" is transliterated as Zhongguo guangbo in mainland China, and Chungkuo kuangpo in Taiwan, but they mean the same. Among the easiest to hear Taiwanese stations are powerful transmitters of the Voice of Kuanghua (sample ID of this "Kuanghua chih sheng"). 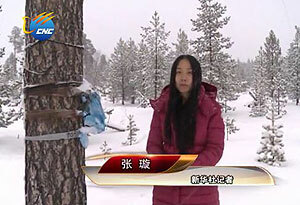 These broadcasts are aired around the clock and are targeting mainland China. The external service Radio Taiwan International broadcasts also in Chinese, and can be easily recognized since "RTI News" (as pronounced in English) is often mentioned at the top of the hour. In addition to China and Taiwan, you may encounter Chinese programming especially from two religious broadcasters in South Korea, HLKX (1188 kHz) and HLAZ (1566 kHz), both used by the Far East Broadcasting Company. Occasionally they use call letters as part of the station ID. The more powerful HLAZ can be heard identifying as "Liang you yi you diantai yu nin, qian shou tong xing" ("Good friend and beneficial friend radio, keeps your company"). If none of this sounds familiar, we'll return to look for answers from mainland China. As the Chinese broadcasting scene is becoming ever more diversified, the above hints on time announcements and different station identification patterns may not be enough to help you identify your catch. To properly identify the more trickier cases from mainland China, we need to take a closer look at how radio broadcasting is organized in China. Occasionally station identifications are given even in English, especially on China Business Radio. For detailed information on additional frequencies and the remaining networks, check out resources listed in the end. On provincial level China has 33 units (mostly known as provinces, but including also some municipalities, autonomous regions and special administrative regions), excluding Taiwan which China claims as the 34th province. Provinces have a government-run broadcasting company in the capital, and a varying amount of local stations around the province. Then you just add the location (province or city name) in front of the above ID template, and voilá, you've got the typical ID announcement for that particular channel. The ID may be preceded by zheli shi, which means "This is". Diantai (radio station) or dianshitai (TV station) can be used in addition to or instead of guangbo (broadcasting station), but it all means roughly the same. Words in the above listing can also be combined. For instance, Jiangsu jiankang shenghuo pinlu (this soundfile generated, not recorded live) means "Jiangsu Healthy Living Frequency" (which broadcasts on 846 kHz). 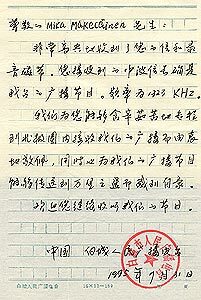 With this listing I'm already slipping from my promise and premise that just a few words and phrases are enough to identify Chinese stations, but you don't need to memorize these all, you can always return to this article and use the above listing and the embedded sound files as your reference. - Liaoning General Service: "Liaoning zonghe guangbo [twice], AM 1089, FM 102.9" ID at 12 seconds. 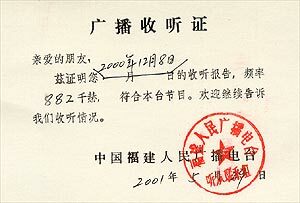 Then at 22 seconds "Liaoning guangbo dianshitai, di yi tao guangbo jiemu, xinwen zonghe pinlu" ("Liaoning radio and TV station, the first program, news and general frequency"). Also one more ID at 41 seconds. This station is heard on 1089 kHz. As you can hear, renmin is increasingly going out of fashion these days. Commercial spots abound, but this lucrative broadcasting business is still a government/party monopoly, and there are no private radio stations outside of Hong Kong (on 864 and 1044 kHz) and Macau (738 kHz). To make matters more complicated, sometimes the ID that you hear has nothing to do with the identity of the transmitter you're listening to. Local stations often rebroadcast provincial stations. Also, both local and provincial stations can rebroadcast CNR, even at prime time. 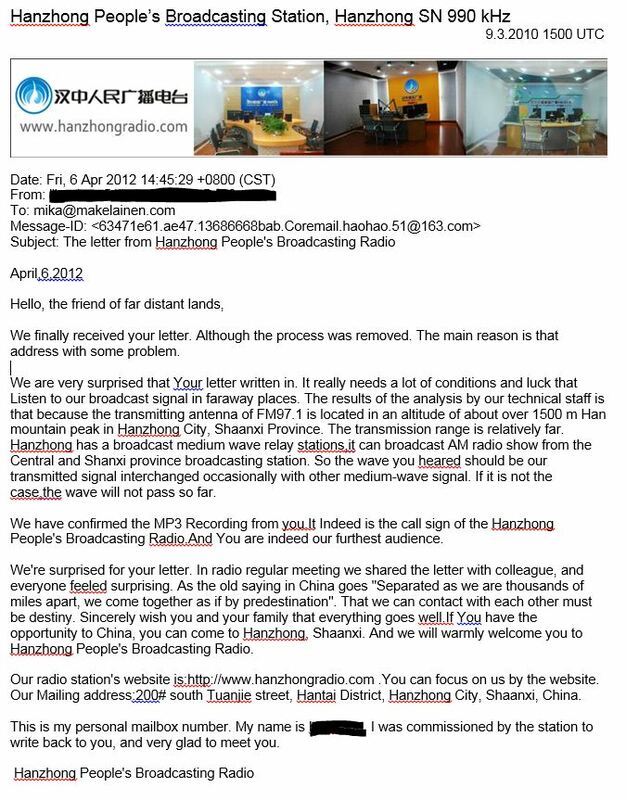 A recent confucing case has been Qianjiang PBS in Hubei Province on 1242 kHz. It has never been logged by DXers using its real name, but instead it has always been relaying Wuhan PBS, such as in this ID: "Wuhan renmin guangbo diantai, AM 873, FM 884". This clip is interesting also because it gives another valuable tool for you to try to figure out the identity of a Chinese station: the frequency announcement (in this case: "AM ba-qi-san, FM ba-ba-si"). The frequency announcement can reveal a relay of another AM frequency, or give a parallel FM frequency, which can disclose the identity of the station even if you can't figure out a single word of the station name. FM frequency announcements are especially handy as some stations don't bother to identify at all, just occasionally throwing in their FM frequency and perhaps a slogan. Rarely, connecting the dots is just impossible. Back in 2010 I heard a top-of-the-hour ID for Hanzhong PBS in Shaanxi Province on 990 kHz. However, there is not a single station in Shaanxi on 990 kHz. Hanzhong PBS confirmed that the ID was theirs, but struggled to find an explanation as to how it was heard on 990 kHz, and it still remains a mystery. If none of the above has been helpful in identifying your catch, it may be that you've caught a foreign service broadcast by China Radio International (CRI). CRI is easy to identify as it has a distinctive interval melody between broadcasts, and it usually gives a very clear bilingual station ID, first in Chinese "Zhongguo guoji guangbo diantai" and then in the language of the target area. Here is an example of CRI beginning a broadcast in Korean on 1017 kHz. CRI also runs radio stations inside China, but they broadcast mostly in English. - Voice of the Strait: "Haixia zhi Sheng, xinwen guangbo" ID at 4 and 11 seconds on 666 kHz. Based on what you have learned before, you know that the second part of the ID means this is a News service. Interestingly, this station is run by the Chinese army. - Voice of Jinling: "Jinling zhi Sheng" ID at 11 seconds on 1206 kHz. - Voice of Pujiang: "Pujiang zhi Sheng guangbo diantai" ID at 8 seconds on 1422 kHz. You may notice that the frequency is also announced: AM yi-si-er-er at 14 seconds. - Southeast Broadcasting Company: "Dongnan Guangbo Gongsi", giving an ID at 1 second on 585 kHz. If you're still perplexed about the identity of your catch, let's take into consideration that the ID may not be in Chinese after all, but perhaps instead in one of the many minority languages used in China. The single most common Chinese AM station heard in Europe is the most powerful transmitter of the CNR Tibetan Service on 1098 kHz. Here's a top-of-the-hour language sample, but figuring out an ID in Tibetan would require a more professional linguist. This 1000-kilowatt transmitter is not located in Xizang (Tibet), but instead in Qinghai, which has a sizable Tibetan minority. Xinjiang Uighur Autonomous Region is China's closest area to Europe, so many European DXers have heard programs also in the Uighur language. Here is an example of how the Xinjiang PBS Uighur General Service identifies in Uighur. Uighur is written from right to left, and most often in alphabets based on Arabic, which you can find for example at the Xinjiang PBS website. If you speak Uighur, please be in touch, it would be great to have some help in transliterating a station ID from Uighur. Another minority language often encountered by DXers is Mongolian, which in China is mostly spoken in Inner Mongolia (Nei Menggu). Inner Mongolia is rapidly expanding its network of AM transmitters, so you can expect to hear Mongolian even more in the future. This is how Inner Mongolia PBS Rural and Pastoral Service identifies, conveniently in three languages. The Chinese version goes like this: "Nei Menggu renmin guangbo diantai, nongcun muqu guangbo, luye zhi sheng", and the English name sounds like "Grazing Radio Inner Mongolia", but again, I could use some help in understanding and transliterating station identifications in Mongolian. Another northern language which has gained prominence on the Chinese AM dial is Korean, broadcast on some stations in Heilongjiang and Jilin. The most powerful such station is Yanbian PBS on 1206 kHz, often heard during closing time station identifications around 1600 UTC. DXers in South East Asia or the Americas may have a better chance hearing Minnan languages, such as Amoy and Taiwanese, which are spoken in parts of Fujian and Taiwan. The most common station in Cantonese (which is spoken in Guangdong and Hong Kong) is Zhujiang Economic Broadcasting Station on 1062 kHz. If you have by now succeeded in identifying your catch, you may want to consider sending the station a reception report. DXing is still virtually unknown in China as a hobby, so being in touch with Chinese radio stations can become a fascinating experience. My reception reports to Chinese radio stations have over the years resulted in numerous articles in the local and national Chinese media. Many stations are thrilled to hear from overseas listeners, but on the other hand, getting a reply is often difficult. You can improve your odds by writing in Chinese. Keep your sentences simple, and Google Translate will do a good enough job unless you can get translation help from a native speaker. - Asiawaves.net, maintained by Alan Davies, organized by frequency. Here you can copy the name of the Chinese station in Chinese characters, add an FM frequency which you heard mentioned, and paste it to a search site to look for a homepage of that rare new channel that you've caught. - MW list for Asia and Pacific with lots of streaming audio links is an excellent resource for checking how the station identifications sound. Over the years I have received much help from fellow hobbyists in China and Taiwan. They have listened to numerous station identifications, which at the time were gibberish to me. With this article I hope to pass on what I have learned about identifying Chinese radio stations, so that many more DXers would be able to get a running start in exploring the Chinese radio scene. Your feedback has also greatly improved this article. A special thank you to Li Jizhi for several transliterations, to Victor Qian for audio clips of the province names, and to Pyry Mäkeläinen for scripting the map and audio player. If you notice mistakes, or if you can provide help by transliterating more of the announcements here, please be in touch. It should be mentioned that the sample station identifications embedded in this article have been recorded in Aihkiniemi, northern Finland, roughly 6000-7000 kilometers away from the Chinese transmitter sites. If you found this article useful, please consider supporting the DXing.info website to keep it online. Even a modest contribution by PayPal is helpful and much appreciated. Begin by clicking the button below. Some browsers may be unable to play the sound files in this article. The latest versions of Chrome or IE should work.